15/2/2019 – New construction completion date is April. 31/12/2018 – Delays caused by a lack of concrete form workers in the ACT. 14/12/2018 - Civil works continue. Recent storm events had little or no impact. Footpaths are under construction. 5/11/2018 – The gross pollutant trap has been installed. 8/11/2018 – Planting will commence soon. The new pond near the Burns Club in Kambah will be a great addition to the area, with a seated platform where visitors can take a moment to relax and enjoy the view. 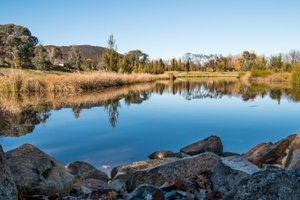 Located just meters from Kambah Village Shops and within a short walk from local playing fields and three schools, the pond is expected to be popular with the local community but it will also play an important role in improving the health of Lake Tuggeranong. 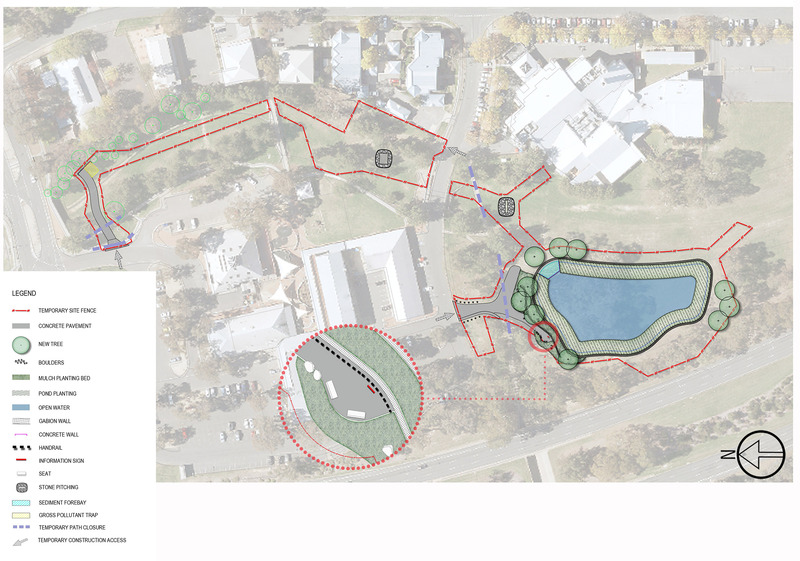 Stormwater will be diverted to the pond from mains adjacent to Marconi Crescent, treated by the pond and returned to the underground stormwater system. With a treatment area of 2,400 square metres, the pond will hold 2,800 cubic metres of water. Each year it will remove over 28,000 kilograms of nitrogen, phosphorous and suspended sediment from stormwater run-off before it flows into Village Creek which, in turn, flows into Lake Tuggeranong. Although a number of trees will have to be removed to make way for the pond, new Casuarina Cunninghamiana will be planted, along with native dryland grasses and water plants. The new pond will also help to mitigate occasional flooding in the area, retaining additional water that will be released following the peak. During construction, parts of the nearby cycling and pedestrian paths will need to be closed for short periods of time. Diversions will be put in place but cyclists and walkers may have to cross access roads or wait for site traffic to pass. Everyone is urged to take care while in the area. During the final design phase, some changes were made to the original concept designs to accommodate services, community feedback and maximise water quality benefits. Thanks to a maze of underground services, the stormwater diversion point was moved further north, closer to Marconi Crescent. This also allowed for an improved fall to the pond. A feature retaining wall was added to the north to reduce the footprint of the earthworks and reduce the impact on native trees. To increase the overall treatment performance of the pond, a 60m3 sediment forebay was added at the inlet. A high-flow outlet was added to the southern end of the pond. 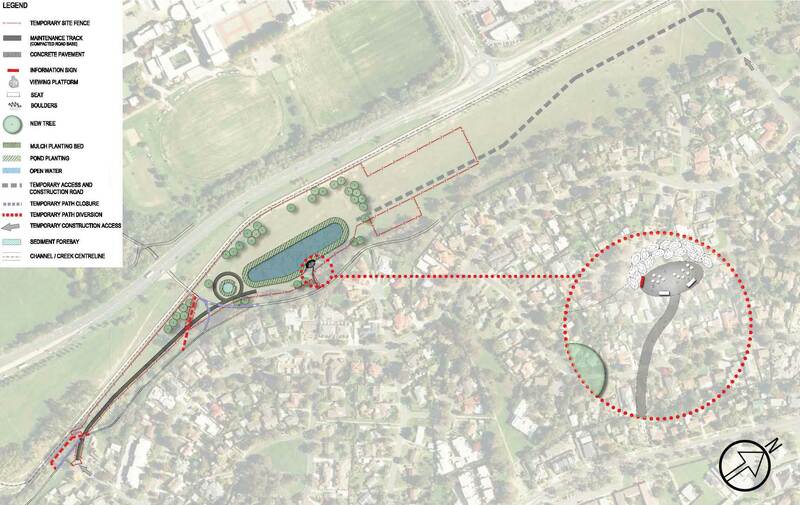 Initial plans proposed an existing stormwater pipe be diverted but site survey and detail design allow for the existing pipes to be retained, eliminating further disturbance of the native trees.